Mount Gede-Pangrango is the one and only most frequently climb mountain in Indonesia by approximately 50,000 hikers per year although the regulations for hikers had been made as tight as possible. It might be because the location of the mount is near Jakarta, the capital of Indonesia, and Bandung, the city known as Paris van Java. To restore the mount’s habitat, the mount is closed for hikers on every August and on December to March. There are also several hiking paths made to reduce the damage to nature, but there is still one popular route which is through Cibodas gate. Since April 1st, 2002, every hiker must book from 3-30 days before visiting the mount. 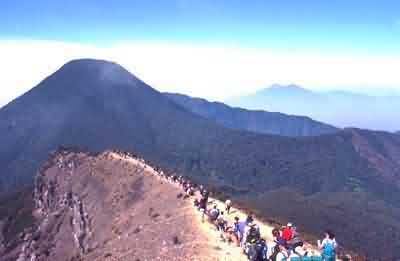 The number of hikers is limited to 600 people per night, 300 through Cibodas, 100 through Selabintana, and 200 through Gunung Putri. Registration is served on Wisma Cinta Alam in Balai Taman Nasional Mt. Gede-Pangrango every weekdays (Monday-Friday) during office hours(8am to 5pm). The posts on Cibodas, Gunung Putri and Selabintana is no longer serving registration, they were only for controlling post. In 1889, Netherlands Indies government set a forest area of 150 km2 at the top of Mount Gede Pangrango as a nature reserve. 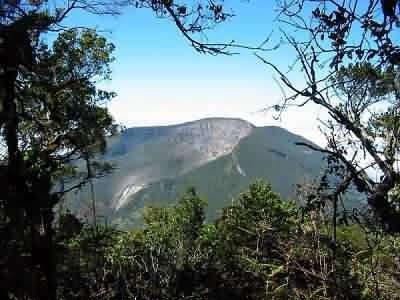 Later on 1980, the Government of Indonesia and changed the status of Mount Gede-Pangrango to National Park. There are 245 species of birds in this National Park. In 1839, there were 2 javan rhino near the top of mountain, the park was also inhabitated by javan bison and deer about 150 years ago. There were many leopards (panthera pardus) reported back on 1929, there were still about 10 of them in 1986, but it’s now all gone. Gede Pangrango is one of the places with the most rainfall in Java, it reaches about 3000 – 4200 mm annualy. Rainy season begins in October until May with over 200 mm rainfall per month, and more than 400 mm every month between December to March, and the park is usually closed at those times. This national park is very important to absorb the rain. The best time to visit the park and hiking are amongst the dry season around June to September, at which the rainfalls is below 100 mm. The average temperature vary from 18º C in Cibodas to less than 10º C at the top of the mountain, with humidity between 80% and 90%. The tenperature at night can fall below 5º C, so make sure to bring a very thick jacket. Hikers also need to be careful because the trees aer easily uprooted. – Minimal climbing gear: warm clothes, sleeping bag, raincoat or waterproof clothing, standard medicine. – Bring enough stock of food and beverages. – Solo hiking is not allowed, you must have at least 3 people in a group and guided by someone who is familiar with the path. – Jakarta – Cipanas(Bandung) : 100 km, 2.5 hours. – Cipanas – Cibodas Park(Gate) : 30 minutes. – Cibodas – Danau Biru(Blue Lake) : 30 minutes. – Danau Biru – Kandang Batu(hot offspring) : 2 hours. – Kandang Batu – Kandang Badak : 1.5 hours. – Kandang Badak – Top of Gede(2.958 meters) : 1 hours. – Kandang Batak – Top of Pangrango(3.019 meters) : 3 hours. – Top of Gede – Suryakencana square : 30 minutes. There is also mystical story about this mountain. So hikers, watch out!